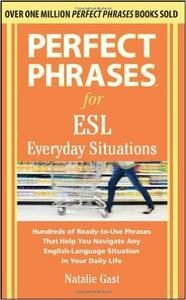 USE JUST THE RIGHT PHRASES AND NAVIGATE DAILY LIFE IN THE UNITED STATES LIKE A NATIVE SPEAKER OF ENGLISHHow do you ask for directions? What questions should you ask a potential babysitter? How do you explain your allergies to a healthcare professional? This handy reference is your guide to surviving and thriving in the United States, whether as a visitor or as a long-term resident. Hundreds of ready-to-use English phrases will help you converse with people you meet, speak withbusiness owners and their employees, and become engaged in U.S. society. Inside find examples of Perfect Phrases for . . .. . . the doctor: Are there any side effects with this medication?
. . . the library: Do you have audiobooks?
. . . the service station: My insurance company wants the estimate in writing.
. . . the bank: Id like to talk to someone about a home equity loan.
. . . the dentist: This is where it hurts.